John Joseph Adams has put out some of the most entertaining themed anthologies in the past few years, taking in zombies, vampires and interstellar civilizations. Now he's putting out an anthology of dystopian fiction, and starting an online fiction magazine. Adams' latest anthology project is called Brave New Worlds, and it'll be published by Night Shade Books, which put out several previous Adams projects. According to Publisher's Marketplace, it'll consist of reprints covering "the best of dystopian fiction from best-selling authors." Lightspeed will be edited by John Joseph Adams, the bestselling editor of anthologies such as Wastelands and The Living Dead, and Andrea Kail, a writer, critic, and television producer who worked for thirteen years on Late Night with Conan O'Brien. Adams will select and edit the fiction, while Kail will handle the non-fiction. Lightspeed will focus exclusively on science fiction. It will feature all types of sf, from near-future, sociological soft sf, to far-future, star-spanning hard sf, and anything and everything in between. No subject will be considered off-limits, and writers will be encouraged to take chances with their fiction and push the envelope. New content will be posted twice a week, including one piece of fiction, and one piece of non-fiction. The fiction selections each month will consist of two original stories and two reprints, except for the debut issue, which will feature four original pieces of fiction. All of the non-fiction will be original. 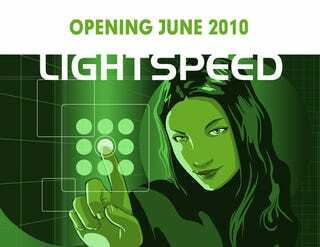 Lightspeed will open to fiction submissions and non-fiction queries on January 1, 2010. Guidelines for fiction and non-fiction will be available on Lightspeed's website, www.lightspeedmagazine.com, by December 1, 2009.